Laser cut, 10g steel, frame rail for all original and reproduction steel '47-'53 Chevy short wheelbase truck bodies. The shape, size, and contour match the original rail exactly. 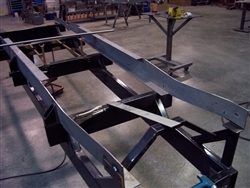 One-piece, full length, 10g steel outer frame rail with upper and lower rail formed over to make a C-channel in the center, straight section of the frame. This formed steel reduces the amount of welding needed and creates a smooth, rounded edge. To this formed rail out 10g boxing plate is welded in. Front and rear are left open to allow use of original bumper brackets. Sold as a PAIR. Note, these rails will also work with the 1947-53 Chevy trucks, but we offer a specific rail for these years also. (SKU 54TRAIL and 54TBOX). Heidts Superide IFS - Custom Application 1933 Chevy Master Boxing Plates 1947-1955 1st Series Chevy truck front boxing plates Stamped frame rails for 1932 Ford.